Recent reports have underscored the importance of innovation and imagination to the pursuit of access to justice. At the Canadian Forum on Civil Justice, we understand that such efforts come down to people – to advocates. In an effort to spotlight the diverse range of individuals working across the access to justice landscape, we are pleased to present the Access to Justice Advocates blog series. Each month we will profile someone who brings a unique perspective and makes a valuable contribution to the issue of access to justice. 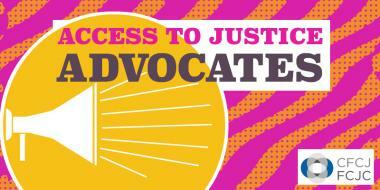 Do you know an access to justice advocate? Let us know at communications@cfcj-fcjc.org. The Canadian Forum on Civil Justice had the wonderful opportunity to meet Professor Mosher at Osgoode Hall Law School to discuss her work in access to justice. As a researcher and teacher, Professor Mosher spoke to us about conceptualizations of access to justice that stimulate her work, as well as the ways in which the intersection between research and frontline advocacy can play a unique role on the access to justice landscape. Her conceptualization of access to justice redirects access to justice advocacy away from courts and towards broader understandings of justice, power and inequality. The full length version of the interview can be found here. From the UK, The Guardian reports on the closing of child contact centres, as legal aid cuts take effect. From the US, there is an article in the ABA Journal on Washington state’s move to use “legal technicians” to help solve the “justice gap”, and two response pieces (#1 and #2) in Above the Law. At Open Law Lab, Margaret Hagan maps a design-driven innovation team. Can We Use TV-Law-Love to Improve Real-Life Legal Services? At Open Law Lab, Margaret Hagan asks if we can use TV-law-love to improve real-life legal services. On SSRN, here is a response to the Law Society of Upper Canada’s ABS discussion paper, by Ken Chasse. Canadian Lawyer has this piece on the launch of the second year of Flip Your Wig for Justice. The Edmonton Journal features this piece by Brent Wittmeier, discussing possible changes to legal services delivery in the Prairies, and some comments from new U of A Law Dean Paul Paton.